This unit will focus on listening, note-taking, and presentation skills, all of which are important to develop for college, university, and the workplace. The themes that tie this unit together are the fertile intersections created when people move and cultures meet. Students will hear inspiring stories of people who have had to start their lives over in new lands. Students will prepare a presentation of their own. In their prose responses, students will analyse a wide range of poetry. Poetic forms, styles, and devices will be examined and discussed. Students will be assessed on a wide range of poetry. In this unit students will be exploring the language and themes of Shakespeare's Macbeth, as well as the reading strategies that will help them understand the play. The skills of planning, organizing, drafting, revising, and polishing a literary essay are examined, practiced, and assessed throughout this unit. In this unit students will be reading two short novels: Ayn Rand's Anthem and Frankenstein by Mary Shelley. In working with these texts, students will examine the historical and political contexts of the authors as well as the novels’ central themes. Assessments deal with the different literary devices employed by the authors and the impact of personal history on perspective. Students will write essays on each of the novels. A3 Reflecting on Skills and Strategies: reflect on and identify their strengths as listeners and speakers, areas for improvement, and the strategies they found most helpful in oral communication situations. B4 Reflecting on Skills and Strategies: reflect on and identify their strengths as readers, areas for improvement, and the strategies they found most helpful before, during, and after reading. C4 Reflecting on Skills and Strategies: reflect on and identify their strengths as writers, areas for improvement, and the strategies they found most helpful at different stages in the writing process. D4 Reflecting on Skills and Strategies: reflect on and identify their strengths as media interpreters and creators, areas for improvement, and the strategies they found most helpful in understanding and creating media texts. Students in English 3U study a number of genres in addition to a Shakespearean play and two novels. Through the use of videos, communication posts, and teacher feedback and draft opportunities, students produce a variety of assignments ranging from oral presentations to formal essays on literature. Video presentations allow students to focus on topics such as bias, developing listening skills, and speaking technique. In preparation for the creation of student videos teachers approve topics, review the essentials of good speeches, and evaluate mind maps. 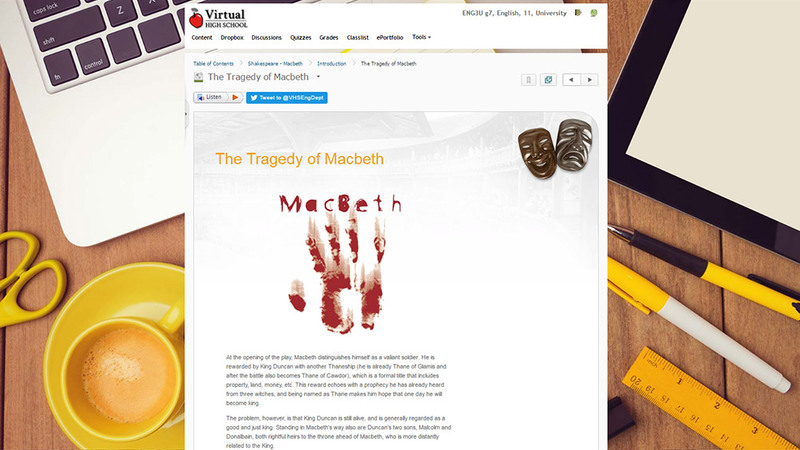 Teaching and comprehensive notes on Macbeth allow students to understand the play and formulate their own ideas. Scaffolded assignments beginning with thesis statements, outlines, and drafts provide a process though which students can improve their performance as writers and critics. Teacing and notes on the novella (Anthem) and Frankenstein allow students to see correspondences between the work and to understand different writing techniques in these two radically different, yet similar, works. Through discussion posts, students study and reflect on the contrasting prose styles in the novels. Note on Oral Communication: Because this is an online course, oral communication is taught and assessed throughout the course using two devices. Students will be required throughout the course to participate in discussions. Some of these will take place on discussion boards where students will post their ideas about a topic at hand in guided discussion format. Students will be required to respond to the ideas of their course-mates. All students will be assessed on their ability to listen, to speak and to think about the strategies they use to do so. In addition students will see icons of speakers throughout the course which they will click on to hear ideas being spoken about and to tape themselves doing the same.